Carbon storage in Australian mangroves can help mitigate climate change. Coastal wetlands don’t cover much global area but they punch well above their carbon weight by sequestering the most atmospheric carbon dioxide of all natural ecosystems. Termed “blue carbon ecosystems” by virtue of their connection to the sea, the salty, oxygen-depleted soils in which wetlands grow are ideal for burying and storing organic carbon. In our research, published today in Nature, we found that carbon storage by coastal wetlands is linked to sea-level rise. Our findings suggest as sea levels rise, these wetlands can help mitigate climate change. We looked at how changing sea levels over the past few millennia has affected coastal wetlands (mostly mangroves and saltmarshes). We found they adapt to rising sea levels by increasing the height of their soil layers, capturing mineral sediment and accumulating dense root material. Much of this is carbon-rich material, which means rising sea levels prompt the wetlands to store even more carbon. What does past sea-level rise tell us? Global variation in the rate of sea-level rise over the past 6,000 years is largely related to the proximity of coastlines to ice sheets that extended over high northern latitudes during the last glacial period, some 26,000 years ago. As ice sheets melted, northern continents slowly adjusted elevation in relation to the ocean due to flexure of the Earth’s mantle. Karaaf Wetlands in Victoria, Australia. For much of North America and Europe, this has resulted in a gradual rise in relative sea level over the past few thousand years. By contrast, the southern continents of Australia, South America and Africa were less affected by glacial ice sheets, and sea-level history on these coastlines more closely reflects ocean surface “eustatic” trends, which stabilised over this period. Our analysis of carbon stored in more than 300 saltmarshes across six continents showed that coastlines subject to consistent relative sea-level rise over the past 6,000 years had, on average, two to four times more carbon in the upper 20cm of sediment, and five to nine times more carbon in the lower 50-100cm of sediment, compared with saltmarshes on coastlines where sea level was more stable over the same period. In other words, on coastlines where sea level is rising, organic carbon is more efficiently buried as the wetland grows and carbon is stored safely below the surface. We propose that the difference in saltmarsh carbon storage in wetlands of the southern hemisphere and the North Atlantic is related to “accommodation space”: the space available for a wetland to store mineral and organic sediments. Coastal wetlands live within the upper portion of the intertidal zone, roughly between mean sea level and the upper limit of high tide. These tidal boundaries define where coastal wetlands can store mineral and organic material. As mineral and organic material accumulates within this zone it creates layers, raising the ground of the wetlands. The coastal wetlands of Broome, Western Australia. New accommodation space for storage of carbon is therefore created when the sea is rising, as has happened on many shorelines of the North Atlantic Ocean over the past 6,000 years. To confirm this theory we analysed changes in carbon storage within a unique wetland that has experienced rapid relative sea-level rise over the past 30 years. 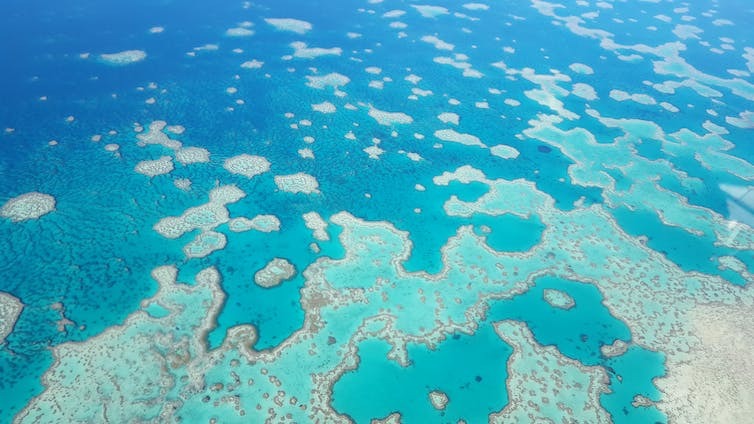 Without wetlands, what will protect the Great Barrier Reef? When underground mine supports were removed from a coal mine under Lake Macquarie in southeastern Australia in the 1980s, the shoreline subsided a metre in a matter of months, causing a relative rise in sea level. Following this the rate of mineral accumulation doubled, and the rate of organic accumulation increased fourfold, with much of the organic material being carbon. The result suggests that sea-level rise over the coming decades might transform our relatively low-carbon southern hemisphere marshes into carbon sequestration hot-spots. The coastlines of Africa, Australia, China and South America, where stable sea levels over the past few millennia have constrained accommodation space, contain about half of the world’s saltmarshes. Saltmarsh on the shores of Westernport Bay in Victoria. A doubling of carbon sequestration in these wetlands, we’ve estimated, could remove an extra 5 million tonnes of CO₂ from the atmosphere per year. However, this potential benefit is compromised by the ongoing clearance and reclamation of these wetlands. Preserving coastal wetlands is critical. Some coastal areas around the world have been cut off from tides to lessen floods, but restoring this connection will promote coastal wetlands – which also reduce the effects of floods – and carbon capture, as well as increase biodiversity and fisheries production. In some cases, planning for future wetland expansion will mean restricting coastal developments, however these decisions will provide returns in terms of avoided nuisance flooding as the sea rises. Finally, the increased carbon storage will help mitigate climate change. Wetlands store flood water, buffer the coast from storms, cycle nutrients through the ecosystem and provided vital sea and land habitat. They are precious, and worth protecting. The authors would like to acknowledge the contribution of their colleagues, Janine Adams, Lisa Schile-Beers and Colin Woodroffe. This summer, coastal seas to the north and east of New Zealand are even warmer than during last year’s marine heat wave. As New Zealanders are enjoying their days at the beach, unusually warm ocean temperatures look to be a harbinger of another marine heatwave. Despite the exceptional conditions during last year’s heatwave in the Tasman Sea, this summer’s sea surface temperatures to the north and east of New Zealand are even warmer. The latest NIWA climate assessment shows that sea surface temperatures in coastal waters around New Zealand are well above average. Marine heatwave conditions are already occurring in parts of the Tasman Sea and the ocean around New Zealand and looking to become the new normal. Currently, marine heatwaves are defined as periods that last for five or more days with temperatures warmer than the 90th percentile based on a 30-year historical baseline. Given we are likely to experience many more such events as the oceans continue to warm, it is time to understand and categorise the intensity of marine heat. The names Hurricane Katrina, tropical cyclone Giselle (which sank the ferry Wahine 50 years ago), tropical cyclone Winston give a malevolent personality to geophysical phenomena. Importantly they get graded into categories, so we can rapidly assess their potential impact. An Australian team has developed a classification scheme for marine heatwaves. The team used an approach similar to that used for hurricanes and cyclones – changing conditions can be slotted into to a sequence of categories. At the moment it looks like we are in marine heat wave category one conditions, but potentially entering category two if it continues to warm. A marine heatwave is potentially devastating for marine ecosystems. It is also an indication that the hidden buffer in the climate system – the fact that the oceans have absorbed 93% of the excess heat – is starting to change. Individual warm seasons have always occurred, but in future there will be more of them and they will keep getting warmer. The Great Barrier Reef has already been hit hard by a succession of marine heatwave events, bleaching the iconic corals and changing the structure of the ecosystem it supports. Further south, off Tasmania’s east coast, a number of species that normally occur in tropical waters have extended their range further south. A number of fish species, lobster and octopus species have also taken up residence along the Tasmanian coast, displacing some of the species that call this coast home. Mobile species can escape the warmer temperatures, but sedentary plants and animals are hardest hit. In New Zealand, aquaculture industries will find it more difficult to grow fish or mussels as coastal waters continue to warm. If the same trends seen off Tasmania occur here, areas with substantial kelp canopies will struggle and start to be replaced by species normally seen further north. But the impacts will likely be very variable because the warming will be heavily influenced by wind and ocean currents and different locations will feel changes to a greater or lesser extent. NIWA’s research vessel Kaharoa has deployed Argo floats in the Southern Ocean and in waters around New Zealand. As important as it is to identify a marine heatwave at the time, reliable predictions of developing conditions would help fishers, aquaculture companies and local authorities – and in fact anyone living and working around the ocean. Seasonal forecasting a few months ahead is difficult. It falls between weather and climate predictions. In a collaboration between the National Institute of Water and Atmospheric Research and the Australian Bureau of Meteorology, we are examining how well long-term forecasts of ocean conditions around New Zealand stack up. Early forecasts suggested this summer would not be as warm as last year. But it now looks like this summer will again be very warm in the ocean. One of the important points to keep in mind is that when we are at the beach, we are sampling only the surface temperature. The same is true of satellites – they monitor less than the top millimetre of the ocean. Sea surface temperatures are several degrees above normal at the moment. But in deeper waters, because of the high heat content of water, even a tenth of a degree is significant. Temperature in the deeper ocean is monitored by a network of moored buoys on and off the continental shelf along the Australian coast. New Zealand has almost nothing that would be comparable. What we can look to, in the absence of moored buoys, is a fleet of ocean robots that monitor temperature in real time. Argo floats drift with ocean currents, sink to two kilometres every ten days and then collect data as they return to the surface. These data allowed us to identify that the 2017/18 marine heatwave around New Zealand remained shallow. Most of the warmer water was in the upper 30 metres. Looking at the present summer conditions, one Argo robot off New Zealand’s west coast shows it is almost four degrees above normal in the upper 40 metres of the ocean. On the east coast, near the Chatham Islands, another float shows warmed layers to 20 metres deep. To the south, the warming goes deeper, down to almost 80 metres. Our work using the Australian Bureau of Meteorology forecast model highlights how variable the ocean around New Zealand is. Different issues emerge in different regions, even if they are geographically close. The research on categories of marine heatwaves shows we will have to keep shifting what we regard as a heat wave as the ocean continues to warm. None of this should come as a surprise. We have known for some time that the world’s oceans are storing most of the additional heat and the impacts of a warming ocean will be serious. Australia’s coastline has moved before thanks to changes in sea level. With global sea levels expected to rise by up to a metre by 2100 we can learn much from archaeology about how people coped in the past with changes in sea level. In a study published this week in Quaternary Science Reviews, we looked at how changes in sea level affected different parts of Australia and the impact on people living around the coast. The study casts new light on how people adapt to rising sea levels of the scale projected to happen in our near future. More than eight out of every ten Australians live within 50km of the coast. The Intergovernmental Panel on Climate Change says global sea levels are set to increase by the equivalent of 12mm/year, four times the average of the last century. A major challenge for managing such a large increase in sea level is our limited understanding of what impact this scale of change might have on humanity. While there are excellent online resources to model the local physical impacts of sea level rise, the recent geological past can provide important insights into how humans responded to dramatic increases in sea level. At the height of the last ice age some 21,000 years ago, not only were the Greenland and Antarctic ice sheets larger than they are today, but 3km-high ice sheets covered large parts of North America and northern Europe. This sucked vast amounts of water out of our planet’s oceans. The practical upshot was sea level was around 125m lower, making the shape of the world’s coastlines distinctly different to today. As the world lurched out of the last ice age with increasing temperatures, the melting ice returned to the ocean as freshwater, dramatically increasing sea levels and altering the surface of our planet. Arguably nowhere experienced greater changes than Australia, a continent with a broad continental shelf and a rich archaeological record spanning tens of millennia. For most of human history in Australia, lower sea levels joined mainland Australia to both Tasmania and New Guinea, forming a supercontinent called Sahul. The Gulf of Carpentaria hosted a freshwater lake more than twice the size of Tasmania (about 190,000km2). Our study shows that lower sea levels resulted in Australia growing by almost 40% during this time – from the current landmass of 7.2 million km2 to 9.8 million km2. The coastlines also looked very different, with steep profiles off the edge of the exposed continental shelf in many areas forming precipitous slopes and cliffs. Imagine the current coastline where the Twelve Apostles are on Victoria’s Great Ocean Road and then extend them around much of the continent. Many rivers flowed across the exposed shelf to the then distant coast. The steep cliffs at the Apostles, off Victoria’s Great Ocean Road, look like parts of the ancient coastline of Australia. Then between 18,000 and 8,000 years ago, global climate warmed, leading to rapid melting of the ice sheets, and seeing sea levels in the Australian region rising from 125m below to 2m above modern sea levels. Tasmania was cut off with the flooding of Bass Strait around 11,000 years ago. New Guinea was separated from Australia with the flooding of Torres Strait and creation of the Gulf of Carpentaria around 8,000 years ago. We found that 2.12 million square km, or 20-29% of the landmass – a size comparable to the state of Queensland – was lost during this inundation. The location of coastlines changed on average by 139km inland. In some areas the change was more than 300km. Much of this inundation occurred over a 4,000-year period (between 14,600 and 10,600 years ago) initiated by what is called Meltwater Pulse 1A, a period of substantial ice sheet collapse releasing millions of cubic litres of water back into the oceans. During this period, sea levels rose by 58m, equivalent to 14.5mm per year. On the ground, this would have seen movement of the sea’s edge at a pace of about 20-24m per year. The potential impacts of these past sea-level changes on Aboriginal populations and societies have long been a subject of speculation by archaeologists and historians. Map of Australia showing sea-level change and archaeological sites for selected periods between 35,000 and 8,000 years ago. PMSL=Present Mean Sea Level. Most tribal groups on the coast 18,000 years ago must have slowly lost their entire territory […] a succession of retreats must have occurred. The slow exodus of refugees, the sorting out of peoples and the struggle for territories probably led to many deaths as well as new alliances. Archaeologists have long recognised that Aboriginal people would have occupied the now-drowned continental shelves surrounding Australia, but opinions have been divided about the nature of occupation and the significance of sea-level rise. Most have suggested that the ancient coasts were little-used or underpopulated in the past. Our data show that Aboriginal populations were severely disrupted by sea-level change in many areas. Perhaps surprisingly the initial decrease in sea level prior to the peak of the last ice age resulted in people largely abandoning the coastline, and heading inland, with a number of archaeological sites within the interior becoming established at this time. Cross-section profiles of the continental shelf at Port Stephens, NSW (top) and Cape Otway, Vic (bottom). PMSL=Present Mean Sea Level. During the peak of the last ice age, there is evidence on the west coast that shows people continued to use marine resources (shellfish, fish etc) during this time, albeit at low levels. With the onset of the massive inundation after the end of the last ice age people evacuated the coasts causing markedly increased population densities across Australia (from around 1 person for every 355 square km 20,000 years ago, to 1 person every 147 square km 10,000 years ago). Rising sea levels had such a profound impact on societies that Aboriginal oral histories from around the length of the Australian coastline preserve details of coastal flooding and the migration of populations. We argue that this squeezing of people into a landmass 22% smaller – into inland areas that were already occupied – required people to adopt new social, settlement and subsistence strategies. This may have been an important element in the development of the complex geographical and religious landscape that European explorers observed in the 18th and 19th centuries. Following the stabilisation of the sea level after 8,000 years ago, we start to see the onset of intensive technological investment and manipulation of the landscape (such as fish traps and landscape burning). We also see the formation of territories (evident by marking of place through rock art) that continues to propagate up until the present time. All signs of more people trying to survive in less space. So what are the lessons of the past for today? Thankfully, we can show that past societies survived rapid sea level change at rates slightly greater than those projected in our near future, albeit with population densities far lower than today. But we can also see that sea level rise resulted in drastic changes to where people lived, how they survived, what technology they used, and probable modifications to their social, religious and political ways of life. In today’s world with substantially higher population densities, managing the relocation of people inland and outside Australia, potentially across national boundaries, may provide to be one of the great social challenges of the 21st century. The wild storms that lashed eastern Australia earlier this year damaged property and eroded beaches, causing millions of dollars’ worth of damage. As sea levels rise, the impact of storms will threaten more and more homes, businesses and services along the coastline. CSIRO projections suggest that seas may rise by as much 82cm by the end of the century. When added to high tides, and with the influence of winds and associated storms, this can mean inundation by waters as high as a couple of metres. As a community, we have to start deciding what must be protected, and how and when; where we will let nature take its course; how and if we need to modify the way we live and work near the coast; and so on. Many of these decisions fall largely to local governments. We have launched a website to help local councils and Australians prepare for a climate change future. 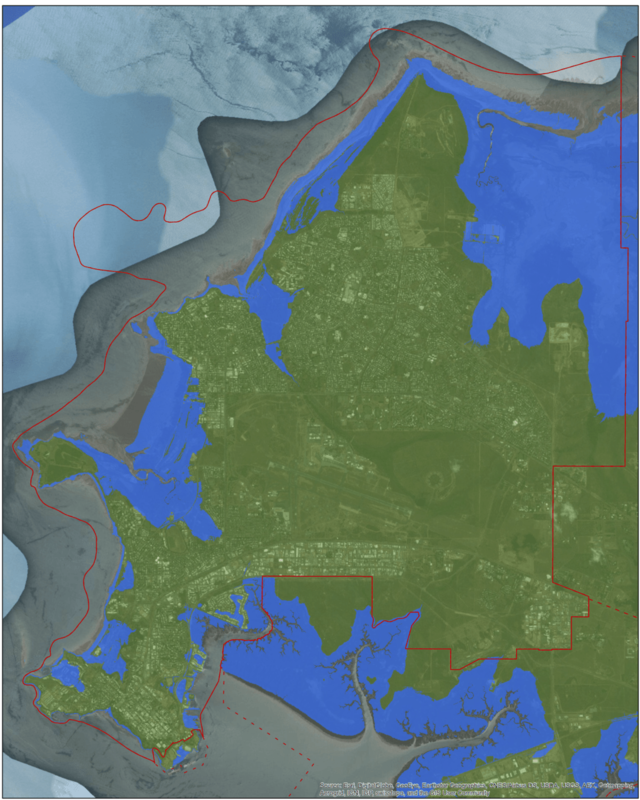 CoastAdapt lets you find maps of your local area under future sea-level scenarios, read case studies, and make adaptation plans. How will sea-level rise affect you? Using sea-level rise modelling from John Church and his team at CSIRO, CoastAdapt provides sea-level projections for four greenhouse gas scenarios, for individual local government areas. This also provides a set of inundation maps for the selected local government area. 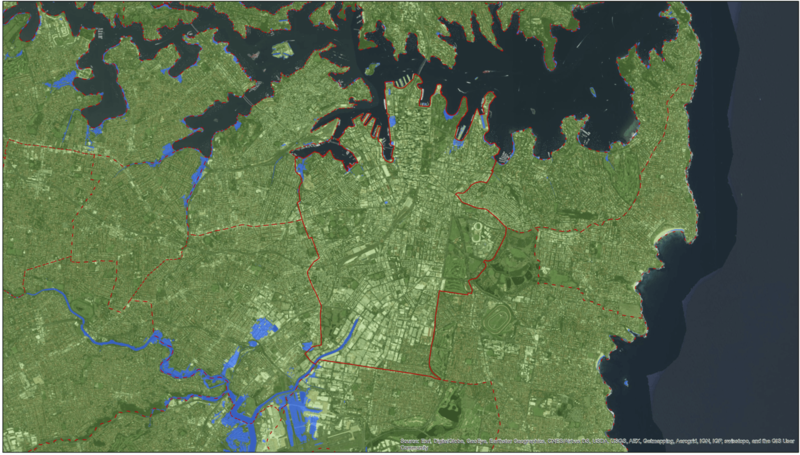 Sydney’s possible sea level in 2100 under a worst-case scenario. Inundated areas shown in pale blue. 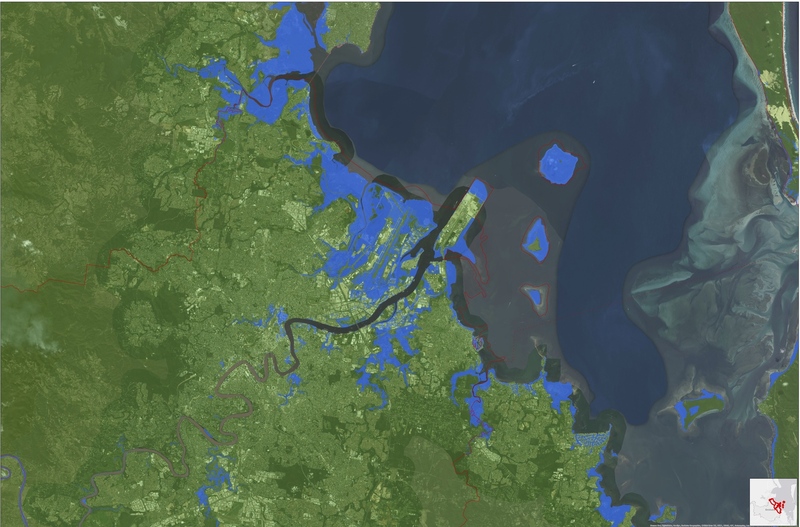 The inundation maps (developed by the Cooperative Research Centre for Spatial Information) show the average projected sea-level rise for a particular climate change scenario, combined with the highest tide. The method provides an approximation of where flooding may occur. Because water is simply filled onto the map according to elevation, it doesn’t account for things like estuary shapes and water movement, the behaviour of waves and so on. Brisbane’s possible sea level in 2100 under a worst-case scenario. Inundated areas shown in pale blue. But both the maps and the sea-level projections are a useful way to start thinking about where risks may lie in any given local government area. CoastAdapt also looks at what we know about coastal processes in the present day. Understanding these characteristics helps us understand where and why the coast is vulnerable to inundation and erosion. For instance, sandy coasts are much more vulnerable to erosion than rocky coasts. The information will help decision-makers understand the behaviour of their coasts and their susceptibility to erosion under sea-level rise. Darwin’s possible sea level in 2100 under a worst-case scenario. Inundated areas shown in pale blue. Adaptation is already happening on the ground around Australian local councils. We have highlighted several of these on CoastAdapt. In the small seaside town of Port Fairy in southeast Victoria, for example, an active community group is monitoring the accelerated erosion of dunes on one of their beaches. The council and community have worked together to prioritise protecting dune areas with decommissioned landfill to prevent this rubbish tip being exposed to the beach. Other councils have already undertaken the process of assessing their risks and drafting adaptation plans. Low-lying areas in the City of Lake Macquarie already experience occasional flooding from high seas. This is expected to become more common and more severe. Lake Macquarie Council has successfully worked with the local community to come up with 39 possible management actions, which the community then assessed against social, economic and environmental criteria. The area now has a strategy for dealing with current flooding and for gradually building protection for future sea-level rise. This approach has engaged community members and given them the opportunity to help decide the future of their community. 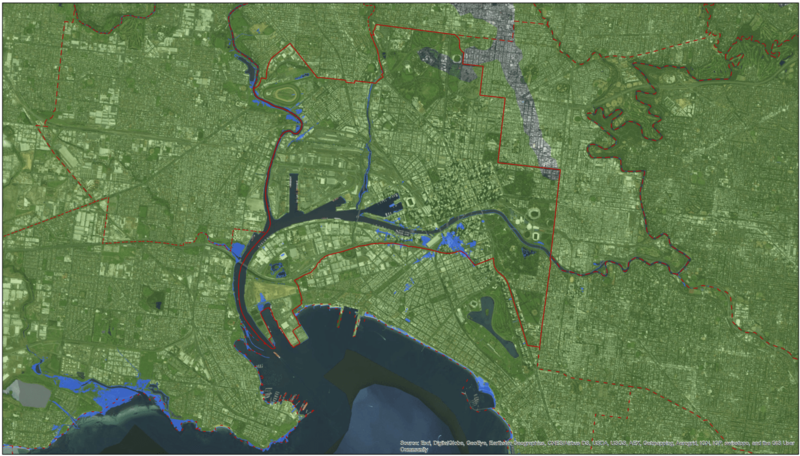 Melbourne’s possible sea level in 2100 under a worst-case scenario. Inundated areas shown in pale blue. What stumps councils and other coastal decision-makers is the scale and complexity of the problem. Each decision-maker needs to have some sense of the risk of future climate change to their interests, then develop plans that will help them to cope or adapt to these risks. Planners and adaptors must navigate uncertainty in where, when and how much change they must consider, and how these changes interact with other issues that must be managed. To better understand the risk, decision-makers need access to timely, authoritative advice presented in ways and levels that are useful for their needs. This is particularly true for an issue such as climate science, which is technically complex. Climate projections, particularly at the local level, come with a level of certainty and probability. The further we look into the future, the more extraneous factors are unknown – for example, will global policy succeed in bringing down greenhouse emissions? Or will these keep increasing, which will necessitate planning for worst-case scenarios? Add to this the questions around legal risk, financing adaptation measures, accommodating community views and so on, and the task is daunting. That’s the thinking behind CoastAdapt – the first national attempt to create a platform that brings together a range of data, tools and research that have been developing and growing over the last decade. As well as maps and case studies, we’ve also built an adaptation planning framework (Coastal Climate Adaptation Decision Support) and set up an online forum for people to ask questions, exchange ideas and even pose questions to our panel of experts. The author would like to acknowledge the work of staff of the National Climate Change Adaptation Research Facility. CoastAdapt is in beta version and is seeking feedback. The final version will be released in early 2017. The link below is to an article featuring 10 of the best secluded coastal camping sites in Australia.